What would Santa Faulconer do? the maritime industry is very regulated and is not the cause of pollution in the barrio. it wasn’t that way maybe 20-30 years ago…..what doesn’t get discussed much is the biggest polluter in the barrio is the traffic from the bridge and the I-5……. 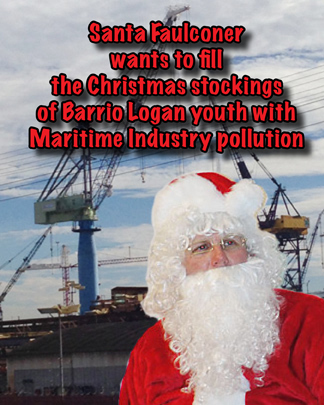 Cahlo – and your proof of such an incredible assertion that the maritime industry doesn’t pollute in Barrio Logan is ? Frank, they all report their emissions to the APCD monthly. this includes paint and welding fumes. sure, they put some stuff in the air, but they all have permits with limits, that gets reported. also, none of the rainwater runoff goes into the bay. they all have catch systems and berms that tests the water prior to putting it in the sewer. my assertion was not that incredible. what is incredible is the fact that no one talks about the pollution from the traffic on the bridge and I-5…….which is the major polluter in that area…….